over the weekend mas and i had one of the best slices of chocolate cake ever. it was magical. it was from the french broad chocolate lounge and it was the highland mocha stout cake. 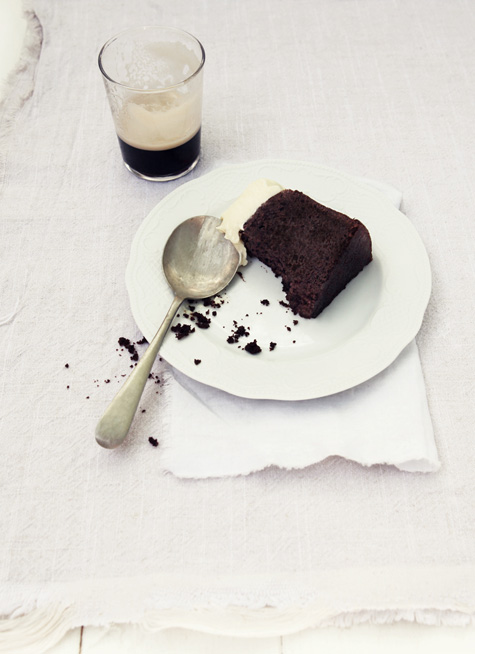 the cake was rich and moist with the perfect taste of the stout, and the frosting, oh my. it was the quintessential butter cream. i can still taste it. so when i was catching up on my much overdue blog reading and saw this post over on design*sponge i thought i might just have to save this recipe until i have the time to make it. which will hopefully be soon, because honestly i could use a piece of good cake. right now. how are you and mas not like, 500lbs? this i want to know. sounds amazing. i'm always looking for a good chocolate cake recipe. i'll definitely be trying it out!